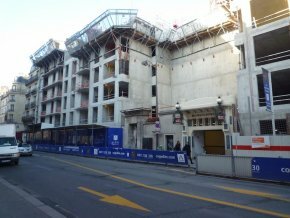 2/1/13 - Heritage - Paris, former Hôpital Laënnec - Almost two years ago, in our last article (in French) concerning the Hôpital Laënnec, we wrote that various associations were ready to fight the project. Alas, so far, nothing has happened. The hospital chapel, which we showed on the French site had never left the public domain, thus nullifying the sale, is still included in the operation since none of the parties gain by taking any action (in any case, not the French Ministry of Culture or the city of Paris which have always been accomplices in the project) and thus have not filed a complaint. However, matters are more serious than they appear, a fact we ourselves discovered when passing by the site. One of the many signs providing details about the administrative permits available for all to see, states that, under the supervision of Benjamin Mouton, architect for historical monuments, the site had received an authorization for work on historical monuments for the "reconstruction of the sacristy" (ill. 1). After making some inquiries, we learned that the building, at the head of the chapel and which dates back to the 18th century, protected thanks to its listing as a historical monument, had in fact been largely destroyed "by mistake" by the demolition company . Allianz Real Estate, in charge of the project on the historical monument told us that it "deplored the human error behind this. The sacristy will be reconstructed with the department of historical monuments and by recuperating the original materials.". Maybe, but we can only admire the beautiful communications ploy at transparency, both on the part of Allianz as well as the DRAC which were careful not to announce this "mistake" and which we have now discovered only a year later, by mere chance, thanks to the mandatory public announcement of the work. We should add that transparency is not Allian’ strong suit as the site is totally closed off to visitors though this does not ensure surveillance since even historical monuments are not safe there. The sacristy will therefore be a totally new historical monument. This will also be the case for the wing which is currently being rebuilt on the south end at the east side of the former hospital, which looks out on the rue de Sevres. This reconstruction - part of the original plans in the project, but in a clearer manner (ill. 2) - will simply be a fake 18th century elevation whose old aspect does not yet seem very obvious (ill. 3). With the constructions already planned around the Fellah fountain (ill. 4 and 5), and the chapel itself, all of the facades looking out over the rue de Sevres will thus be modern ones. This all makes for a very attractive real estate operation, on one of the oldest Parisian hospitals created thanks to a charitable foundation. No matter how hard we try, we cannot find a moral to this story.